Dental implants are titanium alloys made to replace roots of missing teeth. It is usually surgically placed in the jaw bone underneath your gums and fuses to the jaw bone after certain period of time. Dental bridges, dentures and dental crowns are then placed on top of dental implant for function. Mini implants are miniature type of conventional dental implants. They can also be considered as cheap dental implants as they are mostly one quarter to one third of the cost of a conventional dental implant. What is mini dental implant for? Its’ most popular usage nowadays is for denture stabilization. People with full denture (total lost of teeth in upper or lower jaw or both) often face problems like denture looseness, speech and eating difficulties. When we lost our teeth, we lose our jaw bone in time as bone resorbs without teeth. Dentures or false teeth are mainly supported by good jaw bone levels. As mini implants could help preserve jaw bone levels by acting as artificial roots of missing teeth, thus, they could stabilize dentures. What are the procedures of placing mini dental implants? Initial dental check up at a dental clinic is crucial to determine whether you are a suitable candidate for mini implants. Contraindications include uncontrolled diabetes, dementia, severe osteoporosis, immuno-compromised patients (AIDS), drugs abuse and post radiotherapy patients. Factors that may cause failure to the treatment include heavy smoker and drinker, Parkinson’s disease, people with bruxism (clenching teeth often) and growing patient. If you are suitable, radiographs (x ray) would be taken to access the jaw bone levels and to rule out any abnormalities before treatment is proceeded. The dentist would also check your present denture to see whether it is fit for the procedure. Ill- fitting dentures will be either, relined (re-layering of the fitting surface of the denture), rebased (redo the whole fitting base of the denture) or redone. Next, numbers and sizes of the mini dental implants would be determined. Mini dental implants come in four diameters, which are 1.8mm, 2.1mm, 2.4mm and 2.9mm. Each diameter comes with 4 lengths (10mm, 13mm, 15mm, and 18mm). A simple 1.8mm mini implant would resemble a tooth pick. To stabilize a full denture it would usually require 4 to 6 mini dental implants. They are often placed at the anterior part of the jaw to avoid injuring nerve bundles at the posterior region of the lower jaw and sinuses at the upper jaw. After determining the exact spots for mini dental implant placement, dentist would draw the spots on the gums of the jaw with an indelible pencil. The gum is then numbed over the spots. Dentist would drill a small hole with a pilot drill through the gum into the jaw bone. The dentist would then use a finger wrench followed by thumb or ratchet wrench to screw and align the mini implant in the drilled hole. 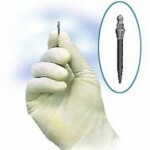 Mini implant is seated until 1.5mm of its shank and the ball above the gums. Hollows are made on the fitting surfaces of your denture corresponding to the placements of mini implants on your jaw. Soft relines are placed in the hollows of the denture to allow it to snap and fit over the ball head of the mini implant. This method transmits less force to the implant, making its integration well with the bone. This soft relines are usually changed once or twice a year. Another method is to put specially designed housing and o-rings in the hollows and allow the denture to snap in firmly to the mini implants. O-rings would be changed accordingly if it wears off. Some dentists prefer putting soft relines for the initial one year to allow better adaptation of patient to the new stabilized denture. After which, permanent housing and o-rings would be placed. Some patients prefer soft relines permanently as they are easy and cheap. It is a minimally invasive procedure that does not require incision and suturing. Healing is immediate. There is no obvious pain and bleeding. You can wear and use your newly retrofitted denture on the same day when you come out of the dental surgery! Mini dental implant can also support partial denture. The treatment is fast as it only requires 1 to 1 ½ hour. If your jaw bone is dense, the mini implants may fracture during screwing. The dentist would usually smoothen and remove the upper part and leave the implant in place to allow its integration with bone. Another spot is drilled afterwards. It is safe to leave fractured implants in jaw bone as titanium alloys integrate well with bone. There is no guarantee to the longevity of mini implants. It still depends on functional load and how your bone reacts to its existence. However, mini dental implants are still a cheap revolutionary remedy for loose denture. This entry was posted in Denture Cares, Oral Surgery and tagged cheap dental implants, cost of a dental implant, dental bridges, dental clinic, dental crowns, dental implants, dental surgery, Denture Cares, false teeth, mini dental implants, partial denture on August 3, 2009 by Dr Erica Tan. I have a upper partial denture which I might add is smooth and does not have indentations like regular teeth.It is so hard to chew with these teeth.I had two reg implants.They didn’t take.Had two more one took and now the oral surgent wants to put in a mimi implant to replace the one that didn’t take.I don’t think he did a bone graft. My dentist has made me another partial denture but he can’t attach it until I have another implant.That will cost me an extra $750. I have already paid him $4000.00 and $5000.00 goes to the dentist. I don’t know what to do. I’m very sorry to hear about your problem, because your condition needs thorough examination to enable me to give you any correct solution, my suggestion would be you could seek second opinion. If you think private dentist is expensive you could go to general clinics or clinics in dental faculty so that they’ll be able to help you at a cheaper price. You could tighten a denture with mini implant but do not use a mini implant to support a tooth like normal implant as this won’t work. Wish you best of luck. My mother has dental implants. She has been unable to find the o-rings that go on them. The dentist that originally did the procedure told her he couldn’t get them and she has gone to another dentist who says that the kind she has have been “discontinued” and that she would have to get new ones. Another $1700.00 that she cannot afford. Is there anywhere that these o-rings maybe located? Are they a special material? Thanks for any help you can give. Hi Shelly, well if the o rings have been discontinued, you may enquire whether the dentist could add soft liners in the holes of the denture base so that the denture could click on to the implants of your mother’s jaw. Soft liners are cheaper but they may need frequent check ups and replacements. Hope that my advice could help! Good day!